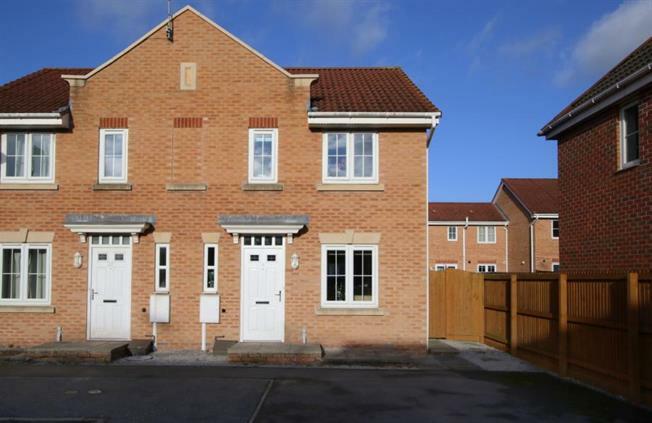 3 Bedroom Semi Detached House For Sale in Chesterfield for Guide Price £160,000. Blundells are excited to bring to the market this beautifully presented three bedroom semi detached property in this popular cul-de-sac location. The property briefly comprises entrance door leading into the entrance lobby which provides access to the downstairs toilet with w.c and wash hand basin. Also from the lobby is access to the living room which leads through to the modern fitted kitchen/diner with door leading out to the rear garden. Stairs lead to the first floor landing which provides access to the three nice size bedrooms with bedroom one having a modern en-suite with w.c, wash hand basin and shower. Also off the landing is the family bathroom with w.c, wash hand basin and bath. To the front of the property the driveway provides off street parking and to the rear of the property the garden is mainly laid to lawn with paved seating area. Chesterfield is a historic market town which lies 11 miles south of Sheffield but still within easy access to Derby. The busy market is on most days and the town center is home to an array of High Street shops, Coffee chains, bars and restaurants. Excellent commuter routes via A617 to Junction 29 of the M1 motorway network along & within easy reach of Chesterfield railway station providing easy access to Sheffield, Derby & Nottingham.